A movement made up of sheriffs claiming to be the highest law enforcement authority in the country is growing nationwide as it exploits hot-button issues such as gun control to encourage sheriffs to defy federal laws they don’t like, according to the Summer 2016 issue of the SPLC’s Intelligence Report, released today. 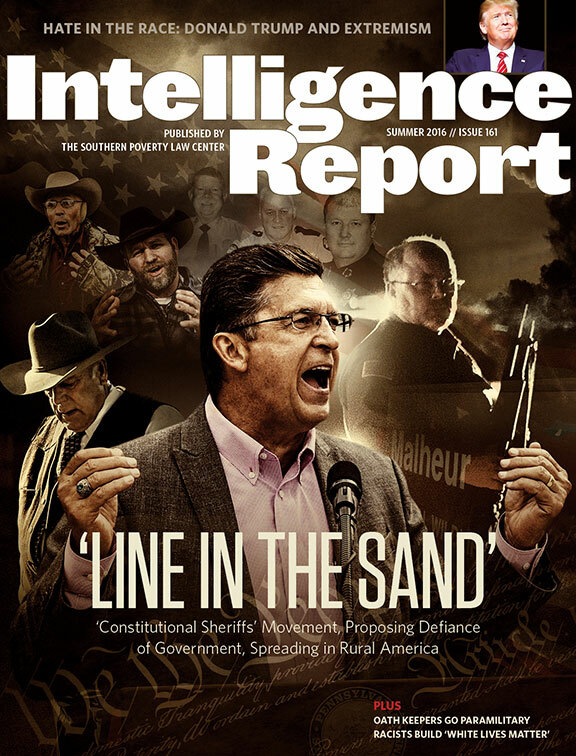 The cover story, “Line in the Sand,” details the growth of this radical ideology since 2009. The movement, formed around an organization called the Constitutional Sheriffs and Peace Officers Association (CSPOA), is a phenomenon rarely, if ever, seen in the United States – a concerted, long-term effort to recruit law enforcement officers into the antigovernment “Patriot” movement. The Intelligence Report interviewed dozens of sheriffs who appeared on a list, compiled by the CSPOA, of almost 500 sheriffs who purportedly had “vowed to uphold and defend the Constitution against Obama’s unconstitutional gun measures.” Overall, it appears the movement is successfully exploiting concerns about gun, environmental and land-use regulations to bring law enforcement officers into the fold. The report notes that the organizing of these sheriffs is occurring against the backdrop of the larger militia movement and the occupation at the Malheur National Wildlife Refuge in Oregon early this year by antigovernment extremists. The threat of the antigovernment “Patriot” movement is also examined in a training DVD included in the law enforcement edition of this issue of the Intelligence Report. The video, a short film designed to be shown at roll call, focuses on the rising threat of antigovernment extremists, especially in the wake of the occupation in Oregon and a related 2014 armed standoff with law enforcement officials in Nevada. “White Lives Matter” is a look at a counter-movement to Black Lives Matter that has been built by radical-right activists. The project, which has become increasingly popular among neo-Nazis and other white supremacists, appears to be largely the work of a 40-year-old woman in Tennessee. “Hate in the Race” is a month-by-month examination of the political vitriol and extremism that has characterized the presidential race since last summer – a deluge of extremist rhetoric coming primarily from Donald Trump. “670 Days” reflects on the nearly two years between Nevada rancher Cliven Bundy’s first armed standoff with the federal government and his arrest in February – a period that saw the antigovernment movement grow by leaps and bounds, in part because of Bundy’s apparent imperviousness to arrest.